This is the first in a three book series which has the Queen assisting in investigations and was published in 1996. 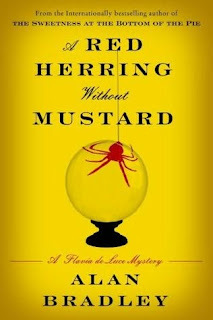 The first in a series in which Her Majesty The Queen, with the help of housemaid, Jane Bee, investigates some mysterious murders at the royal residence. 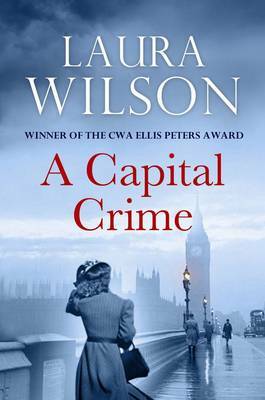 Jane believes her friend, Robin Tukes, a palace footman has been murdered - and so does a VIP who asks Jane to help her investigate. 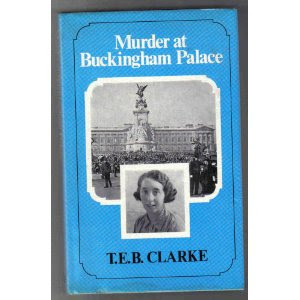 This one's a bit older, coming out in 1981 and according to wikipedia: "purports to tell the story of a hushed-up murder in the Royal residence in 1935. Despite its including 'documentary' photographs, there is no external evidence that the book is anything but pure fiction." 3) it's actually quite short (not a 400 page opus like most of the Dagger submissions!) 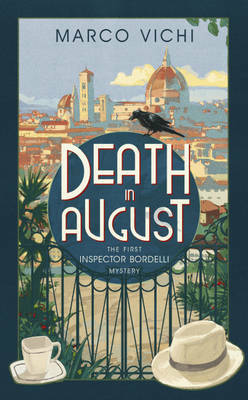 and contains a sampler of book two which is due out in January 2012. 4) it's translated by Stephen Sartarelli (of Camilleri fame) and has some of his notes at the back. This week's selection for "cover opinions" is the US, UK and Canadian covers for Elly Griffiths's The House at Sea's End. This time round the covers are quite similar but what are your thoughts on the US (LHS), UK (RHS) and Canadian (below) covers? 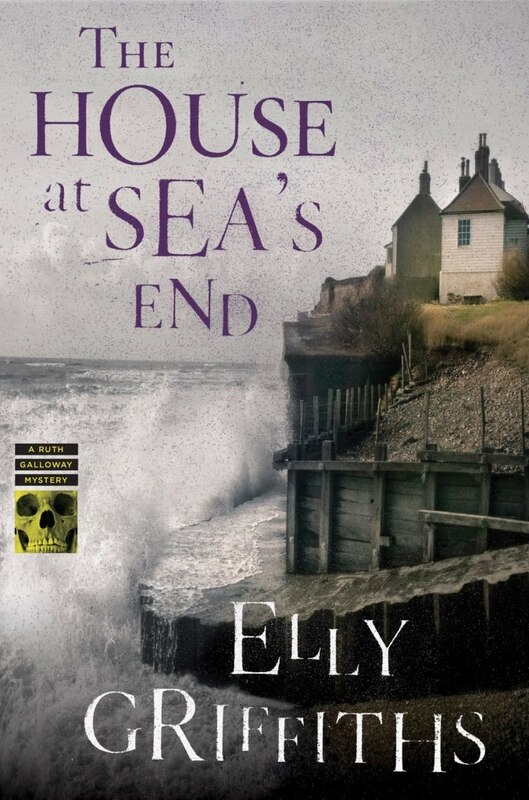 Which would entice you most to pick the book up if you were not familiar with the books of Elly Griffiths? 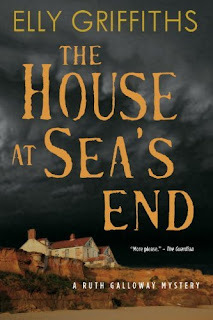 Read the Euro Crime review by Maxine Clarke of The House at Sea's End. 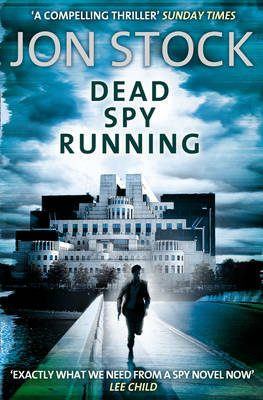 Unfortunately the US edition is not out until January 2012. Before I went on holiday, I was working against the clock to complete the seventh novel to feature profiler Tony Hill and police officer Carol Jordan. UNREDEEMABLE will be released in the UK on September 1st, published by Little, Brown. UNREDEEMABLE features the return of Jacko Vance, the villain at the heart of the second Tony & Carol novel, THE WIRE IN THE BLOOD. Many people have asked me over the years about Vance's fate. This book will, I hope, answer their questions. It's dark, it's bloody and it pushes my characters to their limits. I've had a lot of my American readers asking when TRICK OF THE DARK will be available in the US. I'll be honest - my US publishing history has been a chequered affair. Sometimes it's felt as if US publishers think it best not to tell anyone they're actually publishing my books... So, with TRICK OF THE DARK, I'm taking a sideways step to an indie publisher, Bywater Books. And not just because the editor-in-chief is my wife... I genuinely think that indie publishers can bring a passion to publishing that doesn't always follow through in the big commercial houses. So in September, Bywater will be publishing TRICK OF THE DARK in trade paperback and e-book form in the US. Our marketing slogan will be, 'The girl who Stieg Larsson read,' for reasons that will be obvious to all of you who have read THE GIRL WITH THE DRAGON TATTOO. 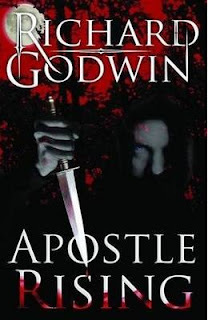 Win a copy of Apostle Rising by Richard Godwin UK & Europe only. I've published a double set of reviews today as, due to family visits, I'll be taking the next two weekends off. The reviews will be back in May and today I have chosen reviews of very recently published books and those due out in the remainder of the month. and Amanda also reviews Satori by Don Winslow a prequel to Trevanian's Shibumi and she doesn't think fans of the original author should be disappointed. Euro Crime has 5 sets of Hakan Nesser's Van Veeteren series (The Mind's Eye, Borkmann's Point, The Return, Woman with Birthmark and The Inspector and Silence) to giveaway. To enter the draw, just answer the (slightly trickier than normal) question* and include your details in the form below. This competition is open to UK residents only and will close on 3 May 2011. You can read reviews of all five books at the Euro Crime website. Plus I have "borrowed" the image on the right from Crimescraps's review of The Inspector and Silence. *Which of these novels did NOT win the Best Swedish Crime Novel Award? 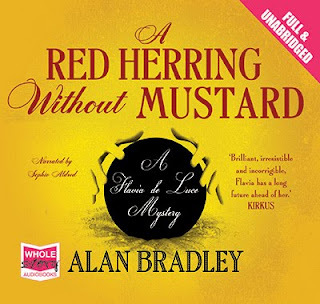 This week's selection for "cover opinions" is the US and UK covers for Alan Bradley's A Red Herring Without Mustard. 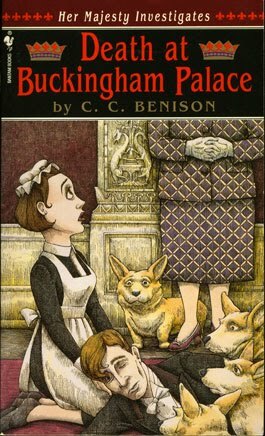 So what are your thoughts on the US (LHS) and UK (RHS) covers? Which would entice you to pick the book up if you were not familiar with the books of Alan Bradley? Hodder has acquired world English rights to a standalone horror novel by Icelandic author Yrsa Sigurdardottir. Editorial director Suzie Doore bought the rights to Blessed are the Children through Petur Mar Olafsson at Bjartur & Verold, with plans to publish in trade paperback for Halloween 2012. 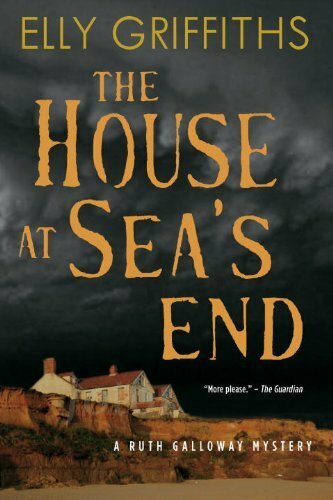 The title tells of three friends, terrorised by the ghost of a drowned child while they renovate a derelict house. World rights for two crime novels were also bought for Arcadia's Eurocrime series. Cold Hearts by Gunnar Staalesen will be published in autumn 2012. 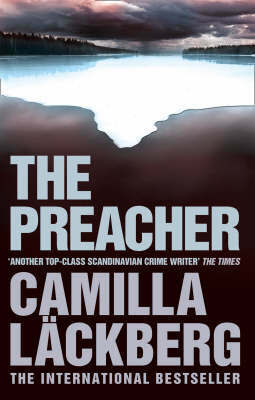 The thriller is about a series of murders in the Norwegian city of Bergen. The other crime book is The Iron Chamber by Matti Joensuu, bought from Hanna Kjellberg from the Otava Agency. The book is about a series of mysterious set of murders in Finland. It will be published in autumn 2012. Bloomsbury has acquired world rights in a series of six crime novels by Bath Literature Festival director James Runcie. Group editor-in-chief Alexandra Pringle scooped the series through David Godwin. The books will feature character Sidney Chambers, honorary canon of Ely Cathedral, as he works with friend Inspector Horatio Keating to unravel case after case. 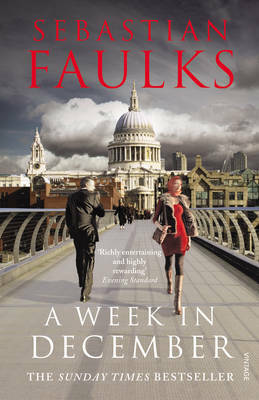 The first title, Grantchester Murders, will be published in May 2012. Liz Foley at Harvill Secker has acquired UK & Commonwealth (excluding Canada) rights to Antti Tuomainen's The Healer, in a deal with the Salomonsson Agency. The Healer will be published in 2013. The Healer is a story of survival, loyalty and determination in merciless times. When the world is coming to an end, all that's left is love and hope. 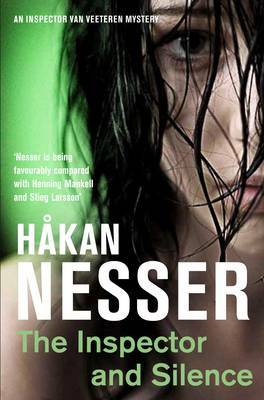 The Healer won the Finnish Academy of Crime Writers' Award 2010 for Best Crime Novel of the Year. This will be a welcome addition to the currently small number of Finnish crime writers available in English translation. I went to London Book Fair today and picked up catalogues and what-not and also bumped into Don Bartlett, who is not only the friendly, charming and talented translator of Jo Nesbo and KO Dahl amongst others, but is also such a gentleman that he even asked after the cats! Anyway, spotted on one of the huge stands, was this huge poster. My friend and I took one look at it and said Scandinavian. 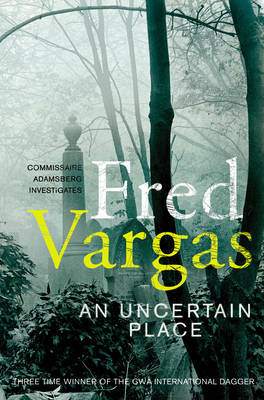 And yes, it's Swedish and will be published in October by Hodder & Stoughton. It is the coldest February in recent memory. In the early hours of a particularly freezing night, the body of a man is found hanging from a lone oak tree in the middle of the withered, windswept plains outside Linkoping, Sweden. The young superintendent Malin Fors, a single mother plagued by personal tragedies, is assigned to the case. 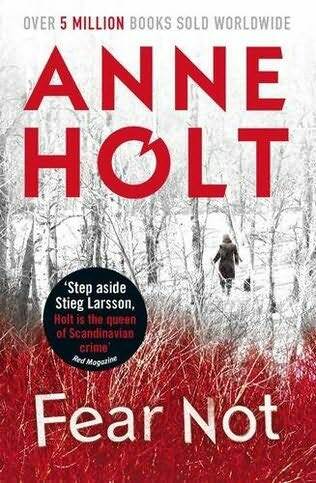 Together with her colleagues from the Violent Crime Squad at the Linkoping Police Department, she must track down the identity of the man hanging from the tree and the reason he ended up there. And at the same time they must follow in the frigid wake of a killer - a manhunt that takes Malin Fors into the darkest corners of the human heart. With Midwinter Sacrifice, I've now begun part 2 of my Scandinavian Crime Fiction Published in 2011 on amazon. Part 1 is here. and Terry Halligan was deeply impressed with Richard Zimler's The Warsaw Anagrams. I've been looking through Quercus's Autumn catalogue and it lists a new Roslund-Hellstrom (authors of the excellent Three Seconds) called Redemption to be published on 29 September and translated, as before, by Kari Dickson. This now makes a full list of 25 titles on my Scandinavian Crime Fiction Published in 2011 amazon list (though it includes the odd US publication) so I'll soon be starting part deux it seems. An interesting thing I've discovered is that Three Seconds is not the third in the series - Redemption is and Three Seconds is actually the fifth which might explain why the main character seemed to change abruptly from Box 21. John Meyer Frey rots on Death Row in Utah for murdering a girl when he was seventeen. His victim's father is desperate for revenge, while his prison guard is torn by feelings of compassion for the young man. Both of them see their hopes thwarted when the killer dies of heart disease before he can be either justly punished or attain redemption. Across the other side of the Atlantic a cheap crooner by the name of John Schwarz earns his daily crust on a ferry between Finland and Sweden. One night he sees a drunkard harassing several women and loses his temper, beating the man so badly that he ends up in hospital. The incident would normally be dismissed as just another drunken brawl, but Detective Inspector Ewert Grens is made suspicious by certain details of the case and investigates further. This will initiate the most remarkable criminal investigation of the sullen, acerbic widower's career, which not only shocks him to the core but blows apart the worldwide debate on the death penalty - and the wider conflict between public justice and private revenge. 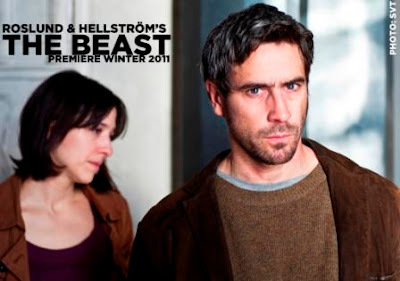 Moving, harrowing, disturbing, Redemption is the third crime novel by Roslund and Hellström, combining a hard-hitting plot with a dark, multi-layered narrative and a killer twist. This week's selection for "cover opinions" is the US and UK (original and reissue) covers for Camilla Lackberg's The Preacher. So what are you thoughts on the US (LHS) and UK (RHS - hardback & original paperback cover on top, paperback reissue below) covers? 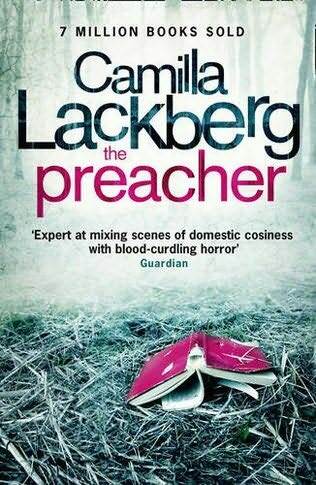 Which would entice you to pick the book up if you were not familiar with the books of Camilla Lackberg? 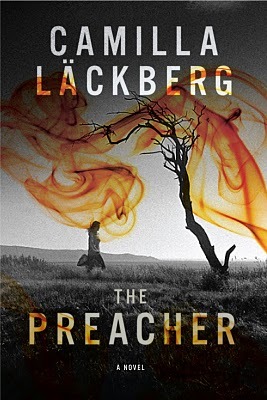 The Preacher will published in the US on 27 April. The covers of the previous book, The Ice Princess, were discussed here. 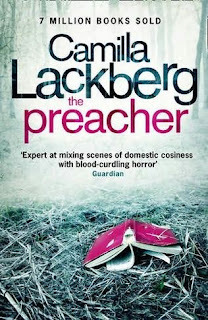 Camilla Lackberg is on twitter @camillalackberg. and Paul Blackburn reviews Laura Wilson's A Capital Crime, the third in the WW2-era Stratton series, which is now out in paperback. Fear Not, Anne Holt's fourth in the Vik and Stubo series will be published in July by Corvus. A drug addict dead in a basement, a young asylum seeker floating in the harbour, a high profile female bishop stabbed to death in the street. What is the connection? During a snowy Christmas season in Norway, criminal psychologist and profiler Johanne Vik finds not only her husband and herself but also her autistic daughter drawn into the investigation of a number of disturbing deaths. Her husband, detective Adam Stubo, has been dispatched to Bergen to investigate the shocking Christmas Eve murder of a local female bishop. Meanwhile, in Oslo, dead bodies keep turning up, though the causes of death vary. Before long, Johanne will incredulously discover something that will link them all. Anne Holt's Fear Not is a thrilling crime novel that raises questions about religion, human rights, and the very nature of love itself. Anne Holt has the courage to go beyond conventional crime writing and peppers the story with red-hot political issues. 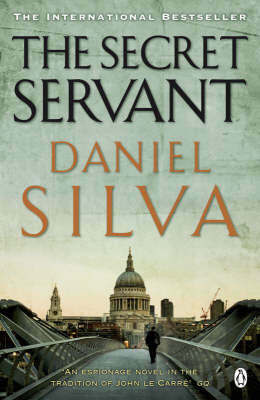 Do have a peep at the sticker on the otherwise attractive cover! I'm not sure yet if this is translated by Kari Dickson who has translated the previous three Vik and Stubos. 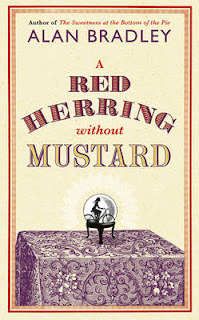 When I reviewed the third book in the "big Marge" series by Aline Templeton, Lying Dead, I commented that I hoped for a swift appearance on audio book of the fourth instalment. Unfortunately it took two years for it to appear and then a few more months for me to get hold of it and listen to it. This time round the events revolve around the small Galloway market town of Kirkluce, where DI Marjory Fleming and her team are based. Picking up a few months after Lying Dead, Marjory's right-hand man Tam MacNee is still off on sick-leave and she has to make do with the less experienced DSs Macdonald and Wilson and DCs Kerr and Campbell. The book opens with the discovery of a dead sheep in the craft centre in Kirkluce. The matter is not deemed important and attention is focused on the possibility of a new large supermarket coming to the town. The craft centre will have to go and the local shop-keepers are worried, however the majority seem to be in favour of it. But the man who owns the land, which includes the craft centre, is Andrew Carmichael. It's not clear what he will do and before his decision is announced he is found shot on his doorstep. There are many suspects, especially as both those pro- and against the supermarket project have a motive. Marjory and her team swing into action and Marjory gives strict instructions that Tam be kept out of it. However he has different ideas and proceeds to carry out his own investigation. Another strand in the book is the persecution of an elderly farmer, by the local youths (neds) who are riding round her property on motorbikes and she fears for her animals. The two threads meet quite early on in the book when there is another shooting. Is there a sniper loose in the area or is there a motive behind the seemingly unconnected killings? As well as the police-work Marjory has her own family problems to cope with, not least the association of her fourteen-year-old-daughter with the neds. Marjory and her team have their work cut out for them with many of the suspects lying and covering up for relatives. Only a final shooting makes it all clear, at least to Fleming who tries to see that justice is done. Lamb to the Slaughter is a good entry in this series though it doesn't quite reach the same heady heights as the previous two. As before, the community where events take place, is well depicted for the reader and you feel you get to the place, though, aside from the police and their relatives, there seems to be few likeable inhabitants. 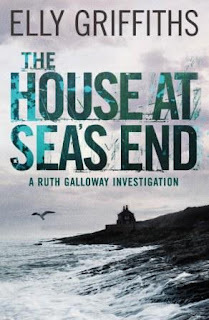 For those used to England-set police procedurals, the differences in Scottish law will be of interest as will the Scottish words and phrases used by some of the characters. The whodunnit is, as usual with this series, impossible to guess or work-out and makes you want to keep loading the cd-player up! This was a compulsive listen and made all the more enjoyable by Cathleen McCarron's skilled narration and as always I adore her Tam MacNee. The next book, Dead in the Water, has just been released as an audio book and I look forward very much to catching up with big Marge and the team in the not too distant future.